The 1000th archived photograph! Well actually we are well passed 1000 now but before I even thought to check it had happened. I figured since there are only 365 days in a year it maybe 2013 before another similar milestone comes along so I better hand out the honor to a photo soon. Patrick Allen during a warm up for a contest at the Pipeline in 1978! 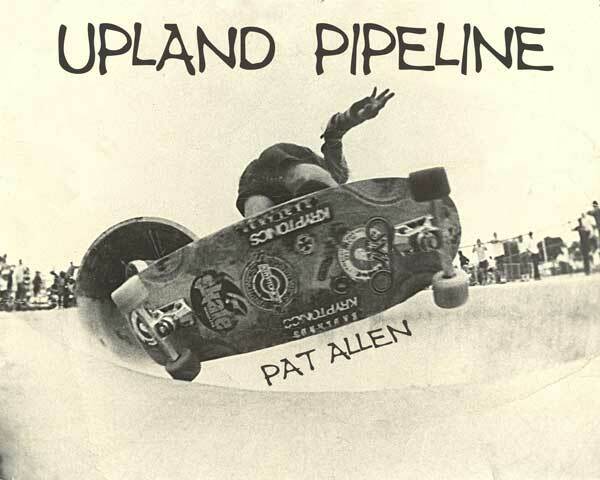 Patrick was a serious local at the park throughout the 70’s and 80’s and since next to The Barn and the NJ ditch the Pipeline was my favorite place I figured lets give the 1000th honors to Patrick for having the oldest photo of the coolest place. This is one of those vintage 70’s shots, when the boards were the photographic feature, like a car ad almost. This was taken in the bowl at the end of the snake run that gets interrupted by the full pipe that gave the place its name. Other then the combi pool there was not a lick of coping in the whole place. We will hear more from Patrick for sure especially now that I am wading into the ‘Vintage’ photo waters. Those are the four categories (Vintage,Classic,Modern, and post Modern. Later we can talk about the four types. So enjoy the fist 1000 collection of archived Vintage,Classic,Modern and Post Modern Skate Photographs as I sort out the next 1000. Thanks to all the contributors who have dusted off their photo albums for safe keeping on [THOS]…your names are all listed to the right so you know who you are! This entry was posted in 1978, Patrick Allen, Photos by Gary polit, Uncategorized on May 16, 2010 by jasonoliva.